How Doth the Little Crocodile is part of Black Phoenix Alchemy Labs’ Alice in Wonderland collection. They call it the Mad Tea Party scents. It was this fragrance that made me realize something in BPAL’ s cedar note is really strong. In Bottle: Smooth, creamy chocolate and pistachio with the iciness of peppermint added in. There’s also the vanilla in this sweetening up the deal a bit. I barely detect the cedar and oak moss in the background giving this fragrance a green, mossy personality and preventing it from fully crossing over to gourmand territory. Applied: Chocolate and pistachio make a good run for the top as they’re quick to evaporate along with all mints. What I get after is a very strong mossy cedarwood fragrance. It’s very green, very fresh and extremely large. It’s almost like there’s a cedar tree up my nose. There’s a mild mossy note too so it’s not just a cedarwood single note on me. I get wee little touches of vanilla on the dry down but for hours and hours all I have is cedar and moss. Extra: “How Doth the Little Crocodile” is a poem from Alice’s Adventures in Wonderland about a crocodile who baits fish into his mouth by smiling. “How Doth the Little Crocodile” is also a parody of another poem, Isaac Watts’ “Against Idleness and Mischief”. Design: How Doth the Little Crocodile is presented in the same way as other general catalog fragrances from Black Phoenix Alchemy Lab. Notes: Chocolate, peppermint, vanilla, pistachio, oak moss, cedar. It’s a shame I don’t like cedarwood that much. Well, that’s not true. I do like it but the cedarwood in this fragrance just loves to amp up on me and drown out everything else in the fragrance. These perfume oil reviews do tend to be more subjective as the notes can react very differently on various people. 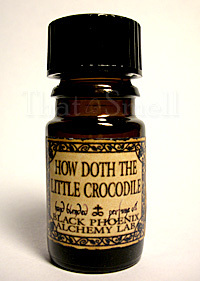 Reviewed in This Post: How Doth the Little Crocodile, 2010, 5ml Bottle. This entry was posted in black phoenix, Reviews By House, woodsy and tagged alice, black, bottle, bpal, cedar, crocodile, doth, fragrance, how, phoenix, review, wonderland, woodsy, woodsy scent. Bookmark the permalink.